Our range of products include weigh batcher. 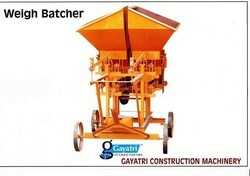 Our company deals in the manufacturing, supplying, exporting and wholesaling of Weigh Batcher which is primarily employed in the road construction process.These Batcher have compact construction and are engineered to perfect on by our industry experts. In addition to this, these are equipped with mechanical joints which are supported by dust covered bearing.These Weight Batcher undergo unmatched finishing under the supervision of our adroit industry professionals. Weighing System : Pan Weight Of 50 And 100 Kg And Jockey Weight To Adjust The Weight From 0 Kg To 50 Kg's. Looking for Weigh Batcher ?